A monkey is dead on the surface of Caipora–a lush, Earth-like planet that was assumed to be habitable by humans. On the exploration ship above the atmosphere, the champagne has already been uncorked, though after the second rhesus monkey is sent down and suffers the same fate as the first, it seems the celebrations were a bit premature. Who would care about the lives of two monkeys lost on the cusp of such a great discovery? Apparently, Pam, the monkeys’ keeper does. She’s got four monkeys left under her care, and is determined to keep it that way. Vladaya wants to send Multik now. I argued that we should send a robot first, try to recover Jane’s body; we could examine it in quarantine and determine the cause of death. But Ikuru said Jane could have eaten something, although she’s trained not to. Putting the blame on me and Jane. I said there’s no evidence, but Vladaya sided with Ikuru, saying we couldn’t know for sure. Before we try picking her up with a robot, it would be easier to send down another monkey. In this flash piece, we catch a glimpse of a woman who has become attached to what were intended to be tools. Though she takes her passions to an extreme, her decision to question the moral dilemma is a valid one. Why is one life worth more than another? It may be easier to raise and train these monkeys than it is to build and send down a robot, but that doesn’t make it the right decision. Or the wrong one, depending on your stance. It isn’t as if this is the first time animals have been used to further science. Should their sacrifices be held in the same regard as those as their human counterparts? It is a fine line to walk. This story is a simple one, but the questions it dredges up are quite complex. If space exploration were looked at as a cross-species endeavor, would it shift the view? One day, when the first dog on Mars is playing fetch with her person, maybe we’ll find the answer in the wag of her tail. 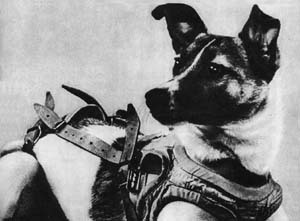 In 1957, Laika became the first animal launched into orbit, paving the way for human spaceflight.